Are you ready for JCF? Honorary List​ In recognition of those previously included on the A list of approved judges who have elected not to accept further appointments. For persons who have previously been approved by the Kennel Club to award CCs in the breed and who have completed their first appointment. To have the support of the Basset Griffon Vendéen Club. For persons who fulfil all the requirements for the A3 list and who have been assessed in accordance with Kennel Club requirements and accepted by the Kennel Club for inclusion on an A2 list and have the support of the Basset Griffon Vendéen Club. To have a minimum of 7 years' judging experience in the breed and have the support of the Basset Griffon Vendéen Club. 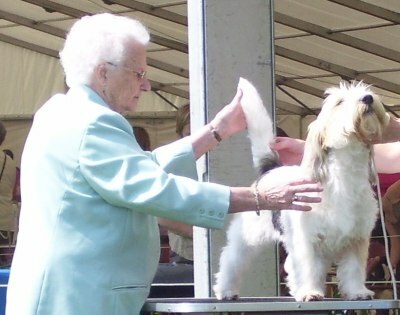 PBGV To have judged a minimum of 16 classes and a minimum of 40 dogs (dogs gone over at one assessment are included). GBGV To have judged a minimum of 16 classes and a minimum of 40 dogs (dogs gone over at one assessment are included). To have attended a seminar given by a KC Accredited Trainer, and passed the relevant examination on KC Regulations and Judging Procedures. To have attended a seminar given by a KC Accredited Trainer on Conformation and Movement. To have attended at least one BGV Club judging seminar run in accordance with the relevant Kennel Club Code of Best Practice and passed an examination and/or assessment. To have bred and/or owned a minimum of 3 dogs when they obtained their first entry into the Kennel Club Stud Book (save in exceptional circumstances). To be prepared to write critiques and submit them for publication within 4 weeks of the show date. To have a minimum of 7 years' judging experience in any one breed (to include 5 years in this breed) and have the support of the Basset Griffon Vendéen Club. ​A List - Overseas Judges​ Overseas Judges must be approved to award Challenge Certificates or their equivalent in the Hound Group in their native country, have demonstrated an involvement in the breed and have the support of the BGV Club. To have 3 years' experience owning and exhibiting in this breed and have the support of the Basset Griffon Vendéen Club. PBGV To have judged a minimum of 4 classes and a minimum of 10 dogs of this breed (dogs gone over at assessment are NOT included). GBGV To have judged a minimum of 4 classes and a minimum of 10 dogs of this breed (dogs gone over at assessment are NOT included). To have attended at least one BGV Club judging seminar and passed an examination and/or assessment. To have a minimum of three years' experience in any one breed and have the support of the Basset Griffon Vendéen Club. To have judged a minimum of 24 hound classes and to have judged a minimum of 4 PBGV classes and a minimum of 10 dogs (dogs gone over at assessment are NOT included). To have judged a minimum of 24 hound classes and to have judged a minimum of 4 GBGV classes and a minimum of 10 dogs (dogs gone over at assessment are NOT included). ​B List - Overseas Judges​ Overseas Judges must have demonstrated an active involvement with the breed or other Hound breeds, be approved to judge BGVs in their own country and have the support of the BGV Club. For aspirant judges who have shown an interest in the breed and have the support of the Basset Griffon Vendéen Club to judge a maximum of three classes of the breed (four if a Puppy class is included). Applicants must have attended one breed specific seminar with a hands-on training session run in accordance with the KC Code of Best Practice. Applicants whom the committee feel do not have the requisite experience for the "B" list may be placed on this list. For aspirant judges who have shown an interest in the breed and have the support of the Basset Griffon Vendéen Club to judge a maximum of three classes of the breed (four if a Puppy class is included). Applicants must have attended one breed specific seminar with a hands-on training session run in accordance with the KC Code of Best Practice. Applicants whom the committee feel do not have the requisite experience for the "B" list may be placed onto this list. For aspirant judges who do not have the required qualifications to be placed on any other list and whom the Basset Griffon Vendéen Club would support to judge a maximum of three classes of the breed (four if a Puppy class is included). Non B List Judges are permitted to judge a Puppy class in addition to the 3 classes currently permitted. It is your responsibility to keep adequate records of classes/dogs actually judged, seminars attended and assessment passes to support your application, as well as details of any stewarding completed. It is also your responsibility to ensure that you familiar with any Kennel Club requirements.